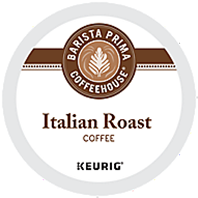 This rich, heavy-bodied cup with its ripe fruit and berry notes epitomizes the time-honored Italian tradition of dark-roasted coffeehouse brews. Bold yet ideally balanced, with a subtle hint of smokiness and a sweet, clean finish, Barista Prima's Italian Roast is a hearty and flavorful testament to the art of dark roasting. Its uniquely potent flavor profile has been masterfully crafted to occupy a special niche between the bright, bold taste of their Colombia offering and the intense, smoky-sweet essence of French Roast. A versatile cup; the ideal accompaniment to sunrise or the perfect ending to an unforgettable meal. 24 Count $14.75 Check back soon!